Our metal USA Map Collector’s Board can now be bought in a set of 65 magnets that include all 50 US states, Washington DC, Puerto Rico and Canada's 13 provinces. These magnets can be put in place on the 18x24 inch Collector's Board. 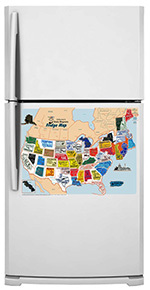 Our magnets have a strong hold and you won't have to worry about the pieces getting out of place.The US states map is not a puzzle map.